Life gets crazy busy sometimes and it’s easy to neglect (or completely ignore) parts of our lives. This Balanced Life Quiz is designed to help you identify which areas of your life need the most attention. Once your life is in balance you will find it easier to meet your goals, grow and succeed. At the end of the quiz, you will be asked for your email address so we can send you your results. 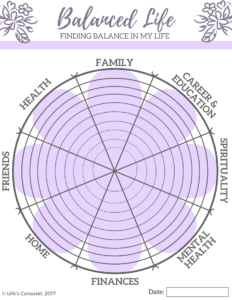 You will also receive FREE access to our Balanced Life Circle printable. Note: When you provide your email address we will add you to our newsletter list. You can unsubscribe at any time from the newsletter with just one click of a button! Check out our article about how to track your Balanced Life with a Self Reflection Day– including a FREE printable Life Balance Circle!